Lipps, Inc. was a funk/disco band from the United States featuring Cynthia Johnson on lead vocals best known for the 1980 worldwide chart-topping hit "Funkytown". The name "Lipps, Inc." is a play on the words "Lip Sync". Cynthia Johnson was the group´s lead vocalist and saxophonist, who co-wrote also some of the band´s songs. The rest of the group consisted of a changing lineup of session musicians, including guitarist David Rivkin, guitarist Tom Riopelle or bassist Terry Grant.. Steven Greenberg wrote and produced most of the group's music. Lipps Inc.'s first release was a 1979 single, "Rock It". The act released its debut album "Mouth to Mouth" in late 1979. The second single from this album, "Funkytown", spent four weeks at #1 on both the Billboard Hot 100 and on the Hot Dance Music/Club Play charts in the United States. The 7" single sold over two million copies within a few months and was awarded a platinum record within the same year of its release, soon after followed by Double-Platinum. "Funkytown" hit thanks to Johnson´s unmistakable lead vocals #1 in 28 different countries around the world. Even till today, Funkytown´s pervasive influence on popular culture continues to hold its own from the movie screen (e.g. Shrek 2) to the Olympic stadium and all stops in-between. Lipps Inc.'s later singles couldn´t top the band's initial success (another Hot 100 entry was "Rock It", which peaked at #64); however, more dance hits were released throughout the 1980s, including "How Long?" in 1981 (originally a hit for Ace) reaching #4 on the U.S. dance chart. 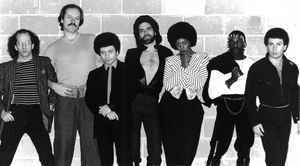 In 1983, after the third album "Designer Music" Johnson discontinued to appear under the band name Lipps, Inc. Instead Margaret Cox, better known as Ta Mara of Ta Mara & The Seen, and Melanie Rosales tried to replace Johnson and released another, final album "4" in 1983 under the band´s name. But neither of them couldn´t replace the remarkable voice of Cynthia Johnson and shortly after the absence of success lead to the disbandment of the group. Viewing All | Lipps, Inc.